The McGee brothers are enjoying their hectic lifestyle as all-Ireland winners but are seeking further improvements. 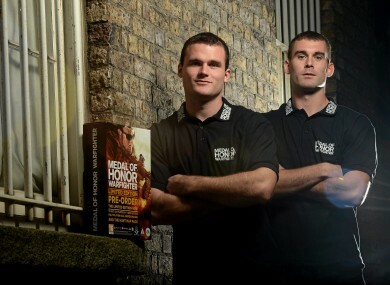 Eamon and Neil McGee at the launch of Medal of Honor Warfighter, which was released on 26 October. WE ALL REMEMBER the day, if our counties were lucky enough to win it, when the Sam Maguire come to school. I was in secondary school when Paul Curran paid a visit, in 1995, with the famous trophy. Sam, a local hero and no maths class – good times. Eamon and Neil McGee can vaguely remember a similar level of excitement when Sam arrived at their primary school in Gweedore 20 years ago. Neil, who picked up his second Football All-Star award on Friday, admits he was too young to properly appreciate the moment but the brothers are enjoying the current trophy tour. Eamon told TheScore.ie that the reality of winning the county’s first All-Ireland since 1992 is slowly dawning on him. “It’s probably only sunk in in the last couple of days when you’ve had the cup in your house or in the car,” he said. “It’s brilliant to know that Sam Maguire is there after you worked so hard for it and you have something tangible to touch and say ‘We have it’. “I took it into a school the last day. It was just me and the cup. It was a surreal moment, to have the Sam Maguire sitting there. For Neil, the magnitude of Donegal’s achievement was impressed upon him on the bus journey back home from Dublin. It was Thursday night before the McGees landed back in Gweedore. Three days later and a club championship match against Glenswilly beckoned. The McGees, for the first time in about six months, were on the losing side. We knew that ourselves, what we had wasn’t going to be good enough to win an All-Ireland. We knew we had to evolve and tweak our gameplan. It was still a tough start (to the year). I think we lost our first five games, between the McKenna Cup and our first two National League games. We eventually adapted. Jim obviously identified that we needed to get more scores and we got into it as the season went on. “I suppose we were guilty of doing (the blanket defence) ourselves with Tyrone, when they were successful, copying their style of play. Armagh too. It never really worked for us and I suppose every team has to come up with their own style of play, one that suits the team and the players in it,” Eamon added. The defenders, who have been playing together since Under 8s (Neil, the younger brother, was advanced to play with the older lads), are determined to make winning a habit with Donegal. “It’s nice and we’re enjoying it,” said Eamon, “but we know we have to go up and do it all again because it is going to be harder work than last year. We’ll savour it but in a relatively quick time and there are no better men than Jim McGuinness and Rory Gallagher to get us back into that zone. Email “Eamon McGee: Driving around with the Sam Maguire in the passenger seat makes it real”. Feedback on “Eamon McGee: Driving around with the Sam Maguire in the passenger seat makes it real”.